"The cold war may be over, but our Russian Imperial Stout is just getting started. Rich, roasted malts, gentle British hopping with earthy Fuggles hops help create just the right balance and character that this style is famed for. 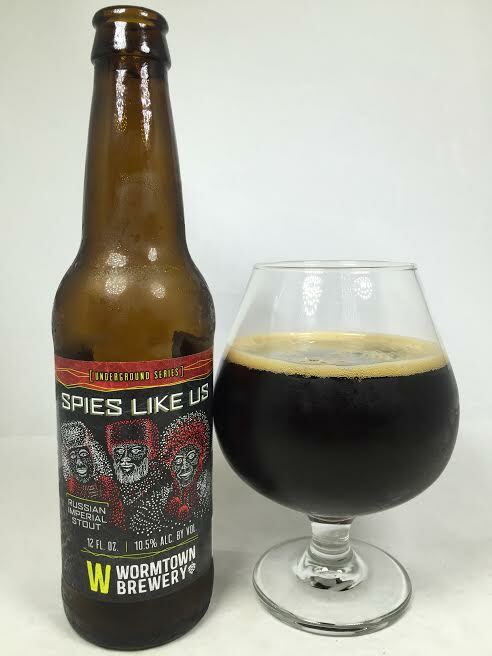 Our label pays tribute to our three secret agents; Tom, David, and Ben, who when they are not saving the world from nuclear war, are helping bring Wormtown to everyone who loves great beer." Pours pitch black with ruby red on the edges and less than a finger of khaki-colored head. Lots of roasted coffee and roasted malts on the nose. Hidden in the back are cherries, dark fruits, and a black licorice/anise aroma. It also has the smell of leather (not a bad thing). Those cherries, plums, and raisins strike first a the front of my tongue. While a coffee flavor was strong on the aroma, I actually don't get it at all here as the dominant force of the taste reminds me more of an Old Ale with a molasses and wood character and there's even a good smokey flavor here too. There's an overall herbal/minty hop influence with small hints of spice all throughout and I'm surprised at such a big hop presence in a massive RIS. If I concentrate hard enough I can detect a small bit of rich, dark chocolate and maybe even some caramel. Mouthfeel is soft, thick, and coats the tongue (phrasing!). I'm impressed by the lack of alcohol presence although there is a slight warming sensation on each sip. It's a sipper for sure. There are so many flavored or barrel-aged stouts out there these days that it makes people forget that a standalone stout is also great if done well. Spies Like Us is big, bold, and flavorful, but without the added bells and whistles. I enjoyed mine in Summer, but this is something you'll want to snuggle up next to on a cold Winter's night.